I originally posted this in January of this year so I am reposting this for my American followers who are now seeing the fourth series of Endeavour. Enjoy. 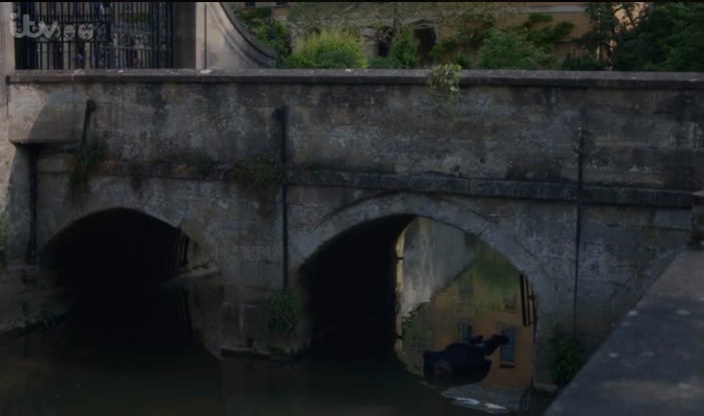 The episode’s cinematography and direction reminded me of the Morse episode ‘Service of all the Dead’. Like that episode the camera lens looked into mirrors, looked through glass often distorted and the sets and scenes were awash (pardon the pun) with a lot of reflective surfaces. Water played a major role in the episode and of course is forever referred to as looking like glass. Of course, water has many meanings from an element that cleanses, gives life, takes life. In dream interpretation water can represent an attempt to not deal with a toxic situation; to sweep it under the proverbial carpet. The crime writer Kent Finn’s latest book is titled ‘Jolly Deep Water’. More on Kent Finn later. The first piece of music we hear is Erik Satie’s (1866-1925) wonderful Gnossiene. The first quote is by Max Debryn to Endeavour when Morse enquires about his thoughts on love. Max replies, “and one was fond of me and all are slain”. I personally didn’t recognize the quote but thanks to two of my blog readers, Lazaro and Edward who pointed out that this quote is from Alfred Edward Housman (1859 – 1936). After JCN the computer has beaten the Russian and all the team are celebrating outside, Professor George Amory tries to get the Russian to take some champagne by saying, “Napoleon’s dictum”, (this is around the 50 minute mark). This is a reference to Napoleon saying, ‘it is better to fight against a coalition than to fight as part of one’. There are quite a few dictums related to Napoleon but I think the afore mentioned one is appropriate in relation to the cold war during the 1960s. Is the use of Lovelace a reference to Augusta Ada King-Noel, Countess of Lovelace (10 December 1815 – 27 November 1852) an English mathematician and writer, chiefly known for her work on Charles Babbage’s early mechanical general-purpose computer, the Analytical Engine. When Morse and Thursday decide to look for the location of a house in Binsey owned by someone with a surname that begins ‘AS’ they ask for help from the team that built the JCN computer at Lovelace College. The computer was originally designed to sort through postcodes etc. Dr. Broderick Castle volunteers to enter the information but Dr Clifford Gibbs points out that Castle had entered ‘rudrum’ when he should have entered ‘redrum’. Of course ‘redrum’ backwards is ‘MURDER‘. Prev Video: My Inspector Morse Pub Crawl July 2017. Next Endeavour S4E1 ‘Game’: A review with Literary References, Locations etc. !!SPOILERS!! Thanks Clare i’m glad you enjoyed the post. I’ve seen a number of places quoting Napoleon saying, “Champagne! In victory one deserves it, in defeat one needs it.” That strikes me as maybe a more appropriate “dictum” here, given that Amory was handling the Russian some champagne? The computer name, JCN, are th next letters in the alphabet from IBM. IBM’s computer beat Gary Kasparov in the first game of a six game match. Kasparov ended up winning the match overall. I thought the white mouse, in the context of a computer lab, was likely a reference to the Hitchiker’s Guide to the Gallaxy series. Nice review and very interesting page. I just re-watched this episode and find all your research very illuminating One thought, Miss Palfrey looks so much like him, she could be Shaun Evans’ mother. Wouldn’t that be fun! I know Roger Allam’s wife was in a recent episode. I agree that Napoleon’s dictum was most likely the one about champagne being deserved in victory and necessary in defeat. Perfect choice by the writer. Very informative blog! Could the reference to “treading lightly” be an allusion to Yeats’ poem Aedh wishes for the cloths of heaven? Is there also a link between IBM, JCN and HAL (the mad computer in 2001) all being linked by the transposition of one letter either side of International Business Machines initials? The mouse reminded me of Flowers for Algernon. You’re welcome Melinda, i’m glad you enjoyed my post. Monica was written out of the series all too quickly. Like your good self Chris I thought likewise with respect to the verbal exchange between Dr Broderick Castle and Dr Clifford Gibbs and the “redrum” remark Gibbs claims Castle erroneously entered into Jason. But, watching the episode with subtitles, as I do, it reads the input code Dr Castle should have entered was “Read drum,” but he mistakenly put in “Rude dram.” So, if correct, there’s no anagrammatic connection with “murder” at all, I’m afraid. It would’ve made for a tasty tidbit I agree, though. A bit late to come up with anything – but- I think the external shots of the swimming baths were taken at Prince of Wales swimming baths in Kentish Town London NW5. A bit far from Oxford but Hey Ho!